If you think that social media is just for keeping in touch with friends and family, you need to think again. Today, 92 percent of employers use social media to recruit and screen candidates. So, if you are searching for a job, you need to sharpen your social skills. Our upcoming webinar can help. We’ll give you an inside-look at how recruiters and hiring managers use social media and give you the advice you need to position yourself as the perfect candidate. As a business leader, you're constantly focusing on your team’s output. But in order to get the most out of all of your employees, it’s important to get their input, too. Our upcoming webinar can help. We will provide strategies that you can use to create a collaborative environment in your workplace and become an even more effective manager. As an administrative professional, innovation can be the key to your success. By bringing fresh perspective, new ideas and creative solutions to your business, you’ll rise through the ranks at your office and ascend in your career. In our upcoming webinar, we’ll share strategies you can use to bring innovation to your workplace and to your career. You rely on your top employees to fill valuable roles in your business. But if your best employees leave or new critical roles emerge, you need to be prepared to fill the gap. That’s why it’s so important to build an effective talent pipeline, and our upcoming webinar can help. We’ll give you the tools you need to overcome turnover, eliminate your skills gap and grow your business now and in the future. When it comes to a job search, making a good first impression is imperative. However, even before you click “send” on a resume or step foot in an interview room, your presence online has already made an impression on potential employers. In our upcoming webinar we'll explain how to make the right impression online and help you build a winning personal brand. 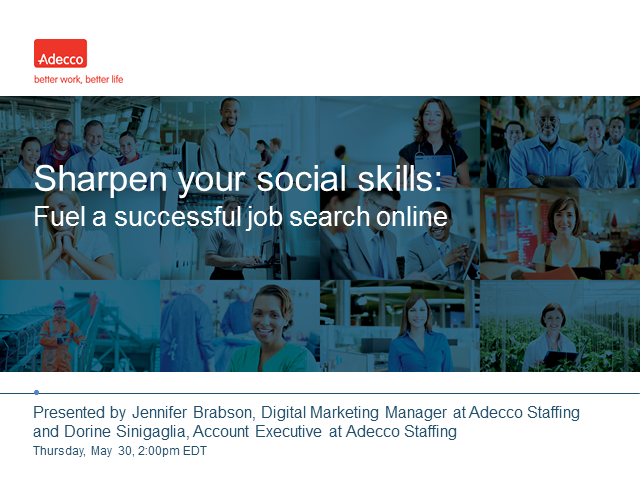 We’ll provide tips for using social media to make your brand say all the right things – and none of the wrong things – about you, your skills and your potential for getting hired. In our upcoming webinar, we’ll take an in-depth look at the current and future state of the U.S. labor market to help you prepare for the year ahead. Success-minded professionals realize they must be proactive and vigilant at all times when it comes to being prepared for career changes and career opportunities alike. Whether you’re simply in need of a little fine tuning or you’re planning a major career overhaul, the strategies we share will get you headed down the right path. If you’re ready to jump start your career in the New Year, let’s get started. People with disabilities offer tremendous value to employers. Unfortunately, however, many businesses struggle when it comes to speaking, working and socializing with this segment of the workforce. In our upcoming webinar, we’ll explore the disability awareness and policy issues that are challenging businesses today. We’ll also provide guidance, based on social justice laws and proven best practices, for ensuring proper etiquette in your office. To become a great leader, you need innovative ideas, in-depth knowledge and great vision. But above all, you a team of employees willing to work hard for you and turn your ideas, knowledge and vision into reality. Our upcoming webinar will help you inspire and better manage your team and become an even better leader. In our second-annual State of the American workforce webinar, we’ll explore the latest trends, issues, challenges and innovations that are shaping the workforce right now. You’ve searched the job boards, you’ve worked your network, you’ve submitted your resume and you got a call back. That’s great, but you still have one big hurdle to clear in order to land your dream job – the interview. In today’s global economy, you need to be everywhere at once. But do your employees all need to be in the same place? In our upcoming webinar, we’ll explore the benefits of virtual workforces and provide practical advice for implementing and managing remote teams. The next generation of engineers is currently making its way through school. But you shouldn’t wait until graduation day to connect with the future of your workforce. In our upcoming webinar, we’ll delve deep into a real-world case study to show you how to build an effective talent pipeline. We’ll also show you how your organization can take a proactive role in engineering education while strengthening your local communities. Military members serve valiantly to protect our country, but they can also serve an essential role in your success. Unfortunately, however, many businesses do not effectively recruit and retain military personnel. In our upcoming webinar, we’ll help your company build a winning program for connecting with this unique and valuable segment of the workforce. - Insight into Military Occupational Codes (MOC's) so you can understand a resume written in "military-ese"
In our free webinar, we’ll provide valuable insight on why you should be investing in tomorrow’s engineering talent. We'll discuss how this relationship can be beneficial to your organization. By taking an interest in talent pipeline today, organizations will be better able to adapt to ever-changing workforce. Social media is no longer just for keeping in touch with friends and family. Today, it is a prominent part of the professional landscape. However, while many people rely on social media to find a job, few know how to utilize social media effectively. In our upcoming webinar, we’ll help you turn your social media presence into a successful professional platform. Join Adecco and explore ways your organization can change for the better in the new year. As the temperatures drop and holidays spring up, many businesses find themselves faced with the challenge of balancing cultural sensitivity, employee morale and workplace productivity. If you are faced with this December dilemma, Adecco's upcoming webinar can make this holiday season one that everyone in your office can celebrate. This interactive discussion explores what makes the season so complex and offers practical strategies for managing the December dilemma in your office. Shifting from life in the service to life in the workforce can be daunting for all veterans. That’s why we’re excited to let you know about our upcoming webinar which can help you deploy a successful battle plan for your career. Being the boss isn't always easy. So, in honor of Boss Day, Adecco would like to offer a little encouragement to hard-working managers everywhere. Our free webinar will help you learn proven management skills to streamline team organization and improve morale. Adecco USA is a leader in recruiting and workforce solutions. We have more than 900 offices in North America servicing a range of clients through an integrated suite of workforce solutions.